When did you know you had a vocation? During the latter years of my High School which was staffed mostly with Religious sisters whom I admired. With shock, then “you’re too young” and other reasons, underlying their “We don’t want to lose you” feeling. But wanting to allow me to follow my calling, they gave their 100% support and approval which never wavered. 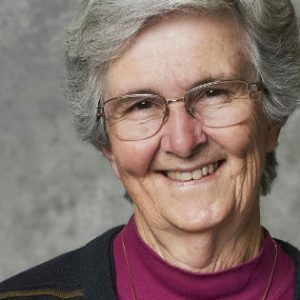 What was the process like in 1960 of joining the Sisters of Charity? An interview with the Superior General; a date set for Entrance – either February 2 or July 2; given a list of things to bring. Postulancy for six months, then a Clothing Ceremony becoming a Novice for two years. It was a time of formation. First vows were made at the end of this time and then you began your ministry of teaching or nursing. Formation continued for five years when final vows were made. How many joined with you, how many left? Eleven young women. Three left and another Novice joined us. So at First Profession there were nine of us. You were a teacher in the making – what were you keen on pursuing? I began Teacher Training in the second year of Novitiate and continued in that profession until I retired from teaching in 2006. What is the major difference you see in Religious Life compared to when you first entered. When I entered, there were possibly 50 to 60 young women in the Novitiate. Today, Religious congregations may have one or two entrants. The question is – What is God asking of us today re Religious Life? With hope and trust we will work together to find the answer. Living under a difficult Superior. Fortunately, the community of Sisters I lived with, were a tower of strength, as was a Congregational Councillor. Despite the hardship, with the support and understanding of these wonderful women, I became a much stronger, resilient person with the coping skills they taught me. Was there a time that was more than usually rewarding? I must say, that in all the places where I lived, I was happy and helped to become the person I am today. However, in one particular community I felt completely at home and accepted as who I am. I found this an amazing Gospel experience and have tried to emulate this experience in other places where I have lived. 9. When people discover you are a Religious sister what is their reaction? 10. What do you see as the future for apostolic life in Australia? I believe the way forward will be different and I am hopeful that we will truly have ‘open hearts and minds’ to follow the new way God is leading us in apostolic life to bring about God’s Reign.